dLook Express Website pages aren’t websites filled with alluring content and expensive images. They are listings of the straight facts of your business: name, phone number, etc. Simple as that. But they are maximised with SEO tags and everything that will make them attractive to search engines. So the objective of dLook Express Website pages is to get you in the top results that will be selected by these kinds of automatic AI functions. And also, it is to make absolutely sure that the AI knows your details so that you won’t miss out on being selected in this way. But this is the part that doesn’t make sense. These forward-looking pages are worth $295 each, but we’re giving them away for free. These pages give search engines exactly what they are looking for and also people. On desktop, mobile and tablet, these pages are optimised to give people your details and even to connect them to your phone at the click of a button. Doesn’t My Business Website Already Do This? Business websites often do the same things, it is true. But they aren’t as attractive for AI. Even for important details in websites that are properly encoded and prioritised, the problem is that they are often overwhelmed by the other content of the website. Matt Cutts, the head of Google’s Webspam team can’t overemphasise the importance of a simple to-the-point site. But this is the problem with minimalism. You can’t be overly simple and to-the-point when designing a webpage for people because you want to leave a warm, positive impression. Which is why, in the years before the business website truly dies—dLook suggests that you maintain your business website, but create dLook Express Website pages also, so that you can maximise both your human-targeted and AI-targeted web presence. There is a trend that is already happening and it has caused many of our clients no end of trouble with their web presence. The trend is: that the days of the single web presence are over. The website is not the sole representative of your business online any longer. There are other presences that you do not control. There are business review sites like Yelp and the notorious Google Reviews which are listed on Google itself when people search for you. There is a new strategy in the future of the web: don’t centralise all your efforts into one website. You must seek to make as many online listings as possible and you must take control of your reviews. The second point is the focus of a different article because dLook also provides a service for Reputation Management. You can see the key to success in the future web is to seize control of the ways your business is represented, or else it will be represented in ways beyond your control . . . This is something very rare—to see a company actually looking any more than 5 years, let along 20 years into the future with their SEO strategy. And we cannot find any other companies having this insight. 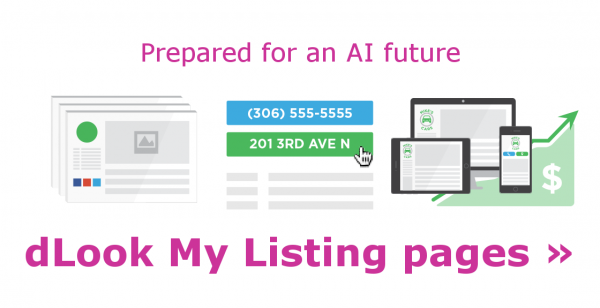 If you are seeing this free opportunity happening in Australia then you are very fortunate to be securing your business a prime position in the AI search listings of the future.